Praising his Chinese counterpart Xi Jinping for moving to abolish limits on his term in office, United States President Donald Trump on Sunday suggested his country might try the same someday, a media report said. Trump said this during a close-door meeting with top Republican fundraisers and supporters, according to CNN, which obtained a copy of his remarks. "He's (Xi) now president for life. President for life. No, he's great. And look, he was able to do that. I think it's great. Maybe we'll have to give that a shot someday," Trump said. According to CNN, Trump's address to his fund raisers and supporters was full of jokes and was delivered in a lighthearted manner. His remarks, likely made in jest, come days after the ruling Communist Party of China said it would abolish term limits on the presidency thus paving the way for Xi to possibly remain president for life. In the US, a president can serve for a maximum of two four-year terms. 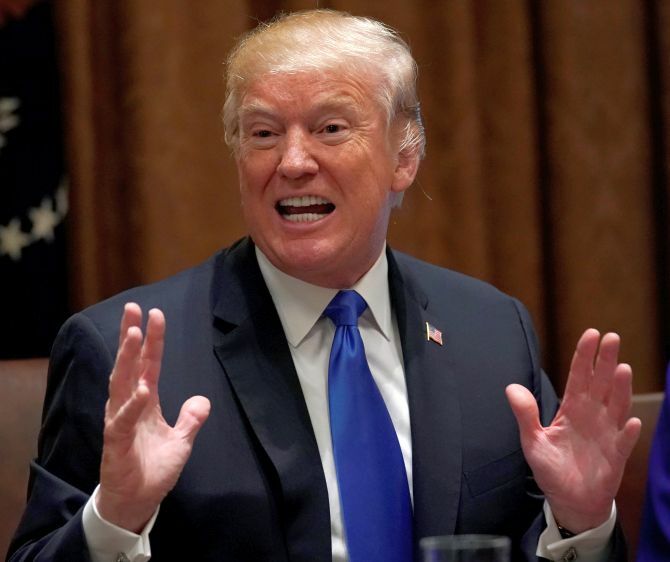 In his remarks, Trump decried the current electoral system which he had repeatedly slammed as being "rigged" in the 2016 presidential campaign. "I'm telling you, it's a rigged system folks," Trump said. "I've been saying that for a long time. It's a rigged system. And we don't have the right people in there yet. We have a lot of great people, but certain things, we don't have the right people," he was quoted as saying. At a high-profile gathering of journalists and politicians, Trump joked about his own impeachment and mocked several media organisations. Arriving late at the Gridiron Club's white-tie dinner, at which dozens of journalists and politicians gather to trade barbs, Trump said he was late because his son-in-law Jarred Kushner could not get through the security. The security clearance of Kushner was recently downgraded. "Ivanka, you’ve got to do something!" Trump said. Both Ivanka and Kushner were seated at the head table along with the First Lady. The president talked about planning his remarks and said he discussed them with the “funniest” people in the White House, including Vice President Mike Pence. “He is straight!” said Trump. “You can’t be impeached when there’s no crime. Put that down!” Trump said. Noting that Attorney General Jeff Sessions was in attendance, he said he offered to bring Sessions to the dinner. “I offered him a ride over and he recused himself,” said Trump. Towards the end of his speech, Trump talked about Deferred Action Against Childhood Arrival. “I love the Dreamers. We are going to help the Dreamers,” he said. Trump said “we’re all working together” on DACA. “I hope that something’s going to happen,” he said. He then went on to mock several media organisations including “the failing New York Times” and CNN. He said CNN recently lost its “very best reporter” in former White House strategist Steve Bannon. He took aim at his favourite target -- media -- “Fake News CNN”. The president also poked fun at Stephen K. Bannon, his former chief strategist, who many inside the White House believe was the source for some of the nastiest parts of the recent book by Michael Wolff. “I like turnover. I like chaos. It really is good,” said Trump. Trump then joked about who would be next to leave the White House and questioned whether it would be “Steve Miller or Melania.” He later referenced the #FreeMelania hashtag. “She’s actually having a great time,” Trump said of his wife. Trump brought up his recent calls for tariffs and suggested they were good for “dying industries” that have asked the White House for “protection”. However, Trump added that it might be “too late” for the “print media. Trump also brought up “talk” former Vice President Joe Biden, or as he put it, “Sleepy Joe”, might run for president in 2020. Trump referenced prior comments Biden made about wanting to take him out behind a barn. While his speech was in joking tone, on North Korea, he quipped that he would not rule out direct talks with North Korean dictator Kim Jong Un. However, he said it was Kim who faced “the risk of dealing with a madman”. He also said North Korea had “called up” and asked to begin talks but that he responded with “you have to denuke” first.